A young couple were walking along a country path near a seaside in England. The path ran along a tall bluff, overlooking a brilliant sea. The drop from the edge to the rocky shore and water below was over a thousand feet straight down. The weather was postcard perfect; blue skies, cool temperatures, and the still of an English morning. The young lovers wanted to get closer to the edge, but a fence had been erected by local authorities to prevent this. People with local knowledge knew things about this precipice that strangers - new people - did not. That was why the fence had been erected. "Hey look!" one of the pair said. "The fence ends up there, just another hundred yards!" "Let's go up there!" "Hey baby. Be careful. Not too close." "It's okay," the other replied. "I know what I am doing!" They tiptoed to the edge, and even leaned over it slightly. The view was breathtaking, and made them dizzy. It was exciting! The cautious one pulled her head back and said, "that's enough!" To celebrate their anniversary, they returned to the same village, stayed in the same inn, and walked the same path. This time though, the skies were grey, and the wind blustered and spit the spray carried up the cliff and over the edge. They were determined not to let the gale dampen their spirits, and they walked along hand in hand, with slickers to protect them from the wet. The wind was fitful, and contrary. It blew first this way, then that. It varied in intensity, and occasionally blew a gust that lifted their jackets. Again they came to the edge of the fence, put there to protect them. Again the bold one said, "let's go look! We did it before, we can to do it again!" Worry was apparent in the other lover's reply, "I don't know. It's different now. Maybe we shouldn't." "Come on...It will be okay! I know what I am doing!" They crept up near the edge, the wind making it difficult to keep their balance. The cautious one crouched and sat down. "You chicken!" said the other. "We've done this before!" At that instant, a surge of wind rising up the vertical wall formed a vortex above the edge. With startling speed and force the wind direction shifted from onshore to off, The young lover - still standing - was blown toward the edge. Too late! - realization. Too close to the edge of ability! Too unpredictable the wind! SOUTH ST. LOUIS, MO (KTVI) – The investigation into the Friday night crash of an ARCH Medi-Vac helicopter could take as long as one year. The helicopter was heading to the Saint Louis University Hospital helipad around 11:00pm when it failed to achieve enough altitude to land. Its rotors struck the side of an outpatient clinic building before it crashed on the parking lot below. On March 6, 2015, at 2310 central standard time, an Airbus Helicopters (Eurocopter) EC-130-B4, N356AM ... struck the edge of a hospital building and impacted its parking lot during a visual approach to the St Louis University Hospital elevated rooftop helipad (MO55), St Louis, Missouri. During the approach, the helicopter experienced a loss of directional control and entered an uncontrolled descent. The helicopter was destroyed by impact forces and a post-crash fire. The commercial pilot, who was the sole occupant, sustained fatal injuries. The helicopter was operated under Title 14 CFR Part 91 as an air medical positioning flight that was operating on a company flight plan. Night visual meteorological conditions prevailed at the time of the accident. The flight was returning to MO55 after it had been refueled at the operator's base in St. Louis, Missouri. The flight's first approach and landing at MO55 was to drop off a medic, nurse, and a patient. During the approach, the pilot reported to the flight nurse and medic that winds were gusting to 25 knots. The flight nurse stated that helicopter was yawing quite a bit and there was a noticeable roll side to side during landing. The helicopter landed without incident during the first approach and landing. The flight then departed to obtain fuel at the operator's base and then departed to return to MO55, to pick up the medic and flight nurse. The accident occurred during the return's approach for landing at MO55. Injuries: 2 Fatal, 1 Serious. The medevac helicopter lifted off the hospital's roof-top helipad at night. The pilot made a right pedal turn to the northwest, facing a building that extended above the height of the helipad by approximately 10-feet. The paramedic said that when the helicopter was about 20-feet above the helipad, and while he was programming the GPS receiver, a "sudden gust" of wind push the helicopter from directly behind. He was not alerted to anything unusual until he looked up and noticed the helicopter's close proximity to a 16-floor brick building, located at the northern corner of the heliport, which extended above the height of the helipad by 4 floors. The paramedic yelled, "building, building, building!" to alert the pilot. The pilot then made a rapid right cyclic input to avoid hitting the building, but the helicopter struck the building, and fell about 13 floors to ground level. On April 15, 2016, about 1955 eastern daylight time, a Eurocopter France AS350B2, N561AM, was substantially damaged after it impacted terrain near Jasper, Georgia. The commercial pilot and three medical flight crewmembers were not injured. Visual meteorological conditions prevailed. The helicopter was operating on a company visual flight rules flight plan from Lanier Park Hospital Heliport (38GA), Gainesville, Georgia, to a helipad at Piedmont Mountainside Hospital, Jasper, Georgia. The helicopter emergency medical service flight was conducted under the provisions of 14 Code of Federal Regulations Part 135. According to the pilot, he made a downwind approach to the helipad over high tension power lines and then turned onto the final leg of the approach. Then, he noted that the tail rotor became "difficult to control" and the helicopter began a "rapid descent with forward airspeed." The pilot reduced the power and unsuccessfully attempted to perform a go-around maneuver. He configured the helicopter for landing by maintaining forward airspeed, raised the nose of the helicopter, however it impacted the ground and "bounced" three times prior to coming to rest. The pilot and three medical crew members then exited the helicopter without anomaly. A post-accident examination of the helicopter revealed that the tail-boom had partially separated from the airframe, which resulted in substantial damage. In addition, there were no anomalies noted with the airframe or engine that would have precluded normal operation prior to the accident. Does anyone see a pattern here? Please forgive my sorry attempt at allegory. I am trying to sound the alarm without sounding "alarmist." I don't want to imply that helicopters can't safely land and takeoff from pinnacles and confined areas (hospital helipads), but I think we as an industry aren't doing enough to prepare ourselves for the environments we will have to face as we conduct these operations. I understand that vested interests want to downplay the dangers of flying in a helicopter. Some ground-based hospital helipads are one-way tree-traps. Hospital administrators apparently ask the groundskeeper or the landscape designer where to put the cement. Some roof-top pads are surrounded by higher buildings that can funnel and shape wind into a hazardous air-hammer that acts on a helicopter like a Hollywood special-effect. Only experiencing them isn't special - it's terrifying. If you live through it, one time is all it takes to know better next time. That's what happens to most of us. We creep up to the edge of the precipice, to the edge of aircraft controllability, to the edge of hurting ourselves. And then we know. But what about the others who don't yet know. Should we let them find out for themselves in some sort of Darwinian thinning of the flock? We need to be talking about this. But the operators don't. At least not any of the four I have worked for. They all left this up to a pilot's experience. Or "tribal knowledge" (whatever the hell that is). Mind you, a HEMS pilot used to come to the game with 3000 hours of flight experience, often in combat, often in a variety of environments, often with actual IMC flying experience. Those days are over. Here's today's pipeline; civil instruction, instructing, an IFR ticket with no cloud time. Time building offshore, and then welcome to HEMS.... Pilots receive a minimum of environmental training, unless it's required for a specific job, like long-line. Today's requirements for a HEMS job are more relaxed than they were when I started in 1999, in both quantity and quality. Employers are dipping deeper into the labor pool. It shows. An anecdote. Yesterday, May 10th 2016, I asked a flight nurse at a random base in the US to ask the pilot, on duty with him a question. "What is the maximum downwind component with which you can land at a hospital helipad?" The answer? "Seventeen knots." So where does that number come from? Seventeen knots happened to be the windspeed at the airport on the day of that aircraft's certification testing for controllability in a crosswind. The test-pilot, flying over a flat, unobstructed airport, wanted to show that the helicopter was capable of flying in adverse conditions, like a crosswind. This helps sell helicopters. The test pilot was able to control the helicopter that day, in that environment, and the measured windspeed was 17 knots. So the certifying body allowed the manufacturer to put that number in the rotorcraft flight manual. What does 17 knots mean to us as we head into a hospital helipad with a tail wind? Not one darned thing. And the pilot who was asked that question hasn't been taught that by the people who hired him, and trained him, and put him on the line flying HEMS. So as it stands today, he will learn about landing at a hospital helipad with a crosswind or tailwind by trial and error. And he will probably be okay. That question, asked of a random HEMS pilot, was my non-scientific research into the need for this blogpost. I actually need to be studying for the USCG captain's test right this minute, but my conscience is driving me to sit here and write this. I don't want to read about any more crashes or meet any more widows. I mean, really, haven't we had enough of that? If the operators won't fix this mess we will have to fix it ourselves. "Okay Maverick, it's time for some of that pilot stuff." I ask you pilots who have been at this awhile to help your brothers and sisters out. Talk about this at shift change. Talk about the scary helipads in your area. Talk about the conditions you will tolerate, and those you won't. Share some of that "tribal knowledge." If you want to be really squared away come up with a locally produced task-condition-standard for cross-wind, tail-wind, high-wind, and gust-spread landings at any confined or obstructed pinnacle helipads in your area. Finally - if it was me - having to land downwind in a heavily-loaded helicopter into a confined area or onto a pinnacle affected by other taller structures? The maximum tail-wind or crosswind component would be 5 knots or less. Not 17 knots. With no, zero, nada, zilch, gust-spread. If I can't land into a stable flowing wind while going into a crappy obstructed confined hell-hole, I am going somewhere else. Winds gusting around obstacles create shear, instant changes in lift and drag that affect different portions of the rotor disk differently, coupled with instant changes in tail rotor authority. Aircraft control can be here one instant, gone the next. I am going somewhere else. Like to an airport. The kind of place where that 17 knot number came from. Do you remember this event? I do. I flew with flight nurse Carolyn Barkow, out of the Lodi, Ohio base, shortly after this crash occurred. She was devastated. The pilot, Mr. Spence, had recently changed employers for personal reasons. She told me that he was an extremely safe and conscientious pilot. You can learn something from studying this. Put yourself in this situation. What would you do differently? There are no new types of air crashes—only people with short memories. Every accident has its own forerunners, and every one happens either because somebody did not know where to draw the vital dividing line between the unforeseen and the unforeseeable or because well-meaning people deemed the risk acceptable. If politics is the art of the possible, and flying is the art of the seemingly impossible, then air safety must be the art of the economically viable. At a time of crowded skies and sharpening competition, it is a daunting task not to let the art of the acceptable deteriorate into the dodgers' art of what you can get away with. — Stephen Barlay, The Final Call: Why Airline Disasters Continue to Happen, March 1990. CLEVELAND (AP) - A helicopter en route to pick up a patient crashed and exploded Friday in a hospital courtyard, killing the pilot and a nurse and injuring a medic. The crash left a trail of broken windows from the top 12th floor of a tower at University Hospitals. The helicopter had lifted off the roof about 12:24 a.m. when it apparently veered back into the building, located in the University Circle neighborhood of museums, colleges and well-kept homes. "I heard and felt the first explosion and saw the fire and couldn't believe it," said Stacy Fetzer, a nursing student who works at the hospital and lives nearby. Pilot William R. Spence, 51, of Marshallville, and flight nurse Kelly Conti, 38, of Wickliffe, were killed and medic Joe Paoletta, 29, of Brecksville, was burned over 25 percent of his body. He was in serious condition at MetroHealth Medical Center. Spence died of burns and smoke inhalation, according to Cuyahoga County Coroner Elizabeth K. Balraj, and Conti died of head, neck and pelvis injuries. No one was hurt in the hospital, which had about 850 of its 947 beds filled. Patients and staff members rushed to look out the windows. The medevac helicopter lifted off the hospital's roof-top helipad at night. The pilot made a right pedal turn to the northwest, facing a building that extended above the height of the helipad by approximately 10-feet. The paramedic said that when the helicopter was about 20-feet above the helipad, and while he was programming the GPS receiver, a "sudden gust" of wind push the helicopter from directly behind. He was not alerted to anything unusual until he looked up and noticed the helicopter's close proximity to a 16-floor brick building, located at the northern corner of the heliport, which extended above the height of the helipad by 4 floors. The paramedic yelled, "building, building, building!" to alert the pilot. The pilot then made a rapid right cyclic input to avoid hitting the building, but the helicopter struck the building, and fell about 13 floors to ground level. 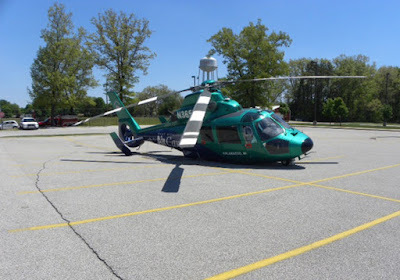 The paramedic did not see or hear any warning lights, horns or unusual noises, and was not aware of any mechanical problems with the helicopter. A police officer who flew two missions in the local area prior to the accident said the wind speed at 500 feet agl was at least 25 knots and gusting from the south/southwest. He stood on the primary helipad after the accident and said mechanical turbulence from the building was evident. An FAA inspector who also stood on the rooftop helipad after the accident said the wind gusts were about 20-30 knots from the southwest and they swirled around the heliport. Review of the helicopter flight manual revealed, "Directional controllability during take-off and landing is assured for flight condition with crosswind components up to 17 [knots]. AMRM Training Solutions : Knowledge Test and Discussion Builder. Feel free to use this test in your safety training sessions, or crew briefings. You may copy and paste, and add or subtract material as desired. We ask that you credit AMRM Training Solutions in your final product. We think the answers should be self-evident; but if you would like to discuss our ideas about the correct answers, leave a comment. Please read each question carefully and circle what you think is the best answer. Some of these questions are purposely designed to foster discussion and interpretation. 1. According to the Federal Aviation Administration, what percentage of aviation accidents are attributable to human error? 2. In what way does Air Medical Resource Management Training differ from Crew Resource Management Training? a. CRM training was originally intended for the major airlines, and more recently has been required for part-135 air carriers as well. CRM is required for everyone on board our helicopters. AMRM training is only pertinent to medical flight team members. c. CRM training is only required for the pilot – the only FAA-acknowledged “crew.” AMRM training is intended for all persons involved with Helicopter Air Ambulances. CRM training is required by regulation. AMRM training is recommended by advisory circular and required for CAMTS certification. 3. As no policy, procedure, or protocol can cover every eventuality for operations in naturalistic environments, what are the three major considerations for decision making, in order of importance, in the absence of other guidance? 4. (Non-clinicians, pilots etc., for the purposes of this question, put yourself in the role of medical flight team member : the purpose of this question is to spark thought and discussion, and your response may be subject to program factors/protocols) You are on scene with your helicopter, picking up a victim of trauma. The pilot advises that “you need to hurry, as a thunderstorm is rapidly approaching your planned destination – receiving hospital.” As you hear this call come over the radio, you are in the back of an ambulance preparing to intubate. What is your response? b. You ask the pilot to coordinate with your com- center on other possible hospitals for the patient, advising him that you are preparing to intubate and may be delayed. You are aware that other destination hospitals may not have all the capabilities and resources that your primary destination had, for example level 2 trauma center status. c. You tell the pilot that you will be proceeding inbound by ground to your primary destination, and he is clear to depart immediately. You are aware that this will create a significant delay in the patient’s arrival to definitive care – but this is your protocol. a. Continue on to the original destination. b. Proceed to the enroute fuel stop. c. Land at the nearby hospital helipad. 6. The medical flight team members have the authority and responsibility to speak up when they are concerned about safety of flight operations. a. This is a true statement. b. This is not a true statement. As stated in the FARs, the pilot is the final authority when it comes to flight operations, and his or her decisions are final. c. This is a true statement, but the flight team must be aware that the timing of - and the manner in which - questions are asked and statements are made can affect responses and outcomes. a. Invulnerability. A pilot with thousands of hours of experience judges herself to be impervious to any sort of adverse events. b. Anti-authority. As HAA pilots are largely self-reliant “lone-rangers”, and are frequently forced to improvise, adapt, and overcome in order to get the job done - over time they tend to bypass rules and approved-procedures in favor of techniques that work for them personally. c. Get-home-it is. This is the most dangerous of all hazardous attitudes in HAA operations because, at the end of the day, we all want to get back to our base. We accept risk as a group. 8. There is a known positive-correlation between experience-levels and the quality of decision-making. A more experienced leader or team-member has been shown by research to always make better choices. a. True. Intuitively we understand that experience improves understanding and the ability to make good decisions. A more experienced team is always going to perform better in a challenging environment, and there is no reason for an experienced leader or team member to include new team-members in the decision-making process. A new team member need never question the decisions of an experienced leader. b. False. Research has shown that decision-makers don’t always make better choices with more experience. Because of the demands of a naturalistic environment, the use of heuristics (rules-of-thumb), and choices that satisfy/suffice (satisfice) in a time-critical, high-consequence environment, experience does not always equal the best decision. 9. Any member of our team may provide a solution to a problem, or help prevent a mishap or adverse outcome. a. True, even a non-aviator can provide life-saving information and assistance. b. False. A pilot has no business making any observations whatsoever regarding a patient’s condition or care. 10. Conducting Helicopter Air Ambulance flight operations is inherently dangerous, and I must accept that such danger is part of the job. I don’t concern myself with “what will be.” I leave my fate to chance and hope. I know that inevitably, some number of HAA crews will be killed each year and nothing can be done to change this. a. This is an example of realistic thinking. Good for you. You are pragmatic enough to accept what history has repeatedly shown to be true. b. This is a classic example of the manifestation of the hazardous attitude known as “resignation.” I can indeed influence my fate, by adhering to the tenets of AMRM and by being an all-in member of this flight team. c. As a medical flight team member, I don’t know enough about flight operations to ask questions, and I don’t feel comfortable requesting education about the flying side of HAA operations. d. As a pilot, I understand that “fate is the hunter,” as explained by famous aviation writer Earnest K. Gann. No matter how much I prepare, no matter how thorough and dedicated to my craft I am, I must accept the fact that a mishap is a real possibility. Since I cannot eliminate risk, I will not concern myself with it.